Benjamin apparently married many times; Bowman lists three wives, the Ancestry World Tree lists five. Benjamin Ellsworth was born on 15 November 1781 at Pittsford, Rutland Co., VT.1 He was the son of Capt. Israel Ellsworth and Hopestill Stevens. Benjamin Ellsworth married Amy Adams in 1802. [S338] Ronald E. Brown, "Israel Ellsworth." Israel Ellsworth was also known as Israel Ellsworth Holliday Jr. He was born in 1785 at Pittsford, Rutland Co., VT.2 He was the son of Capt. Israel Ellsworth and Hopestill Stevens. Israel Ellsworth married Prudence Stevens, daughter of Simeon Stevens and Anna Martin, on 5 December 1805 at Pittsford, Rutland Co., VT. Israel Ellsworth married Lydia Stevens. Israel Ellsworth died on 4 October 1848 at Attica, Lapier Co., MI. Information on Israel and his descendants is from Stanley Ellsworth Page, 2587 West 11275 South, South Jordan, UT 84095, (801) 254-8416, stan_page@bigfoot.com; found on Ancestry.com; He frequently cites the book Our Ellsworth Ancestors by German E. Ellsworth, Mary Smith Ellsworth, and John Orval Ellsworth, 1956, The Utah Printing Company. Additional information from Ronald E. Brown, address available on request. [S65] Deanna Holcomb Bowman Thomas Holcomb, Vol. II:Pg. 2/Item 116142. Jonathan has been attributed to this family, but this has been brought into question. See "A Study of the Ancestry of Jonathan Ellsworth of Oneida County, New York", FHL Catalog 908556, item 4. German Ellsworth's granddaughter has also come to the conclusion that Jonathan is not from this line. Jonathan Ellsworth was born in 1786 at Paris, Oneida Co., NY. He was the son of Capt. Israel Ellsworth and Hopestill Stevens. Jonathan Ellsworth died in 1819 at St. Lawrence, NY. Sylvanus Ellsworth was born in 1787 at Wyalusing, Bradford Co., PA.1 He was the son of Capt. Israel Ellsworth and Hopestill Stevens. Sylvanus Ellsworth died on 4 October 1848. Prudence Stevens was born on 31 December 1787 at Pittsford, Rutland Co., VT. She was the daughter of Simeon Stevens and Anna Martin. Prudence Stevens married Israel Ellsworth, son of Capt. Israel Ellsworth and Hopestill Stevens, on 5 December 1805 at Pittsford, Rutland Co., VT. Prudence Stevens died in 1820 at Leeds, Ontario, Canada. Private in Revolution. Kathy Fenton notes that there were 3 known daughters born in Simsbury, possibly more children. Adonijah Burr was the son of Capt. Adonijah Burr and Thankful Holcombe. Adonijah Burr was baptized on 21 January 1750 at Wintonbury (now Bloomfield), CT. He lived in 1790 at Granby, Hartford Co., CT. He lived in 1800 at Hamilton (Madison), Chenango Co., NY. [S163] Kathleen D. Fenton, "unknown short article title." Zabina served in the Revolutionary War. Kathy Fenton is working on a preliminary document that details the descendants of Zabina. However, right now we can only make assumptions about the probable children of Zabina, based on the fact that other Burr families seem to have left the Granby area by 1800. Data on the few remaining there probably, then, refers to children of Zabina. Zabina Burr was born on 24 November 1751 at Farmington, Hartford Co., CT. He was the son of Capt. Adonijah Burr and Thankful Holcombe. Zabina Burr was baptized on 15 December 1751 at Wintonbury (now Bloomfield), CT. He married Rosannah Dibble circa 1780 at West Granby, Granby, Hartford Co., CT. Zabina Burr died on 10 November 1842 at Granby, Hartford Co., CT, at age 90. Rosannah Dibble was born circa 1762. She married Zabina Burr, son of Capt. Adonijah Burr and Thankful Holcombe, circa 1780 at West Granby, Granby, Hartford Co., CT. Rosannah Dibble died on 17 May 1814 at Granby, Hartford Co., CT.
Asa Burr was born on 2 November 1753 at Wintonbury (now Bloomfield), CT.2 He was the son of Capt. Adonijah Burr and Thankful Holcombe. Asa Burr was baptized on 11 November 1753 at Wintonbury (now Bloomfield), CT. He married Malinda Hoskins on 1 August 1784 at Granby, Hartford Co., CT.2 Asa Burr died on 22 September 1836 at Henrietta, Monroe Co., NY, at age 82. He was buried at Riverview Cemetery, Henrietta, Monroe Co., NY. Corporal in the Revolution. Also resided Hartford & Fowler, Trumbull Co., OH. Asa was recorded in the 1800 census of Granby, Hartford Co., CT.
Asa was recorded in the 1820 census of Henrietta, Ontario Co., NY. [S569] Joy Kielbasa, "Asa Burr," e-mail to James H. Holcombe Jr., 1 January 2005. Roger Burr was born on 1 November 1755 at Wintonbury (now Bloomfield), CT. He was the son of Capt. Adonijah Burr and Thankful Holcombe. Roger Burr was baptized on 9 November 1755 at Wintonbury (now Bloomfield), CT. He married Jane Rich on 1 February 1789 at Sudbury, Rutland Co., VT.2 Roger Burr lived in 1810 at Sudbury, Rutland Co., VT. He died on 26 December 1827 at Sudbury, Rutland Co., VT, at age 72. Kathy cites as the source for the birth date the Rutland Co. History and I assume he was born in Wintonbury like his siblings. The history also says he had seven children. Apparently his mother Thankful was visiting him when she died there in 1827. [S571] Joy Kielbasa, "Roger Burr," e-mail to James H. Holcombe, 1 January 2005. According to Kathy, Bathsheba had 3 Foote children other than Levi and applied for a pension based on Joseph's Revolutionary War service after the death of her third husband. Bathsheba Burr was born on 9 October 1757 at Wintonbury (now Bloomfield), CT. She was the daughter of Capt. Adonijah Burr and Thankful Holcombe. Bathsheba Burr was baptized on 16 October 1757 at Wintonbury (now Bloomfield), CT. She married Joseph Foote, son of Joseph Foote and Azuba Griswold, on 20 October 1778. Bathsheba Burr died on 4 October 1855 at Hartford, Trumbull Co., OH, at age 97. She was buried at Viennna, Trumbull Co., OH. Joseph Foote was born on 27 October 1758 at Simsbury, Hartford Co., CT. He was the son of Joseph Foote and Azuba Griswold.1 Joseph Foote married Bathsheba Burr, daughter of Capt. Adonijah Burr and Thankful Holcombe, on 20 October 1778. Joseph Foote died on 27 May 1789 at Johnstown, Fulton Co., NY, at age 30. Levi Foote was born in 1779 at Simsbury, Hartford Co., CT. He was the son of Joseph Foote and Bathsheba Burr. Levi Foote died in 1841 at Fowler, Trumbull Co., OH. Lavinia Flower was the daughter of Isaac Flower and Bathsheba Burr. Thomas G. Holcombe was born on 5 October 1805. He was the son of Thomas Holcombe and Clarinda Pettibone. Thomas G. Holcombe married Charlotte B. Hoskins, daughter of Rockwell Hoskins and Ruth Adams, on 25 November 1851. Thomas G. Holcombe died on 10 September 1852 at Suicide by hanging, Canaan, Litchfield Co., CT, at age 46. He was buried at Holcombe Cemetery Depot Hill, Granby, Hartford Co., CT.
[S25] Hannah McPherson, Holcombe Genealogy, Page 51.2/Item A-4-5-2-3-1-8-2. [S164] Carol Laun, Holcombe Collection, Page 6. 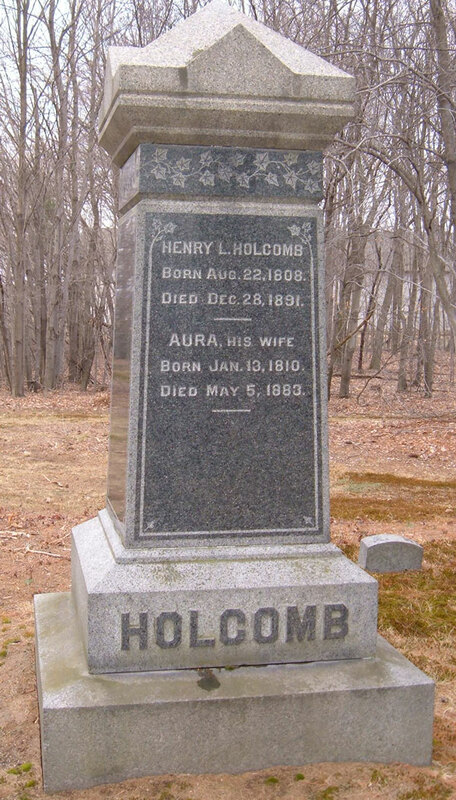 Henry Lyman Holcombe was born on 22 August 1808 at Granby, Hartford Co., CT. He was the son of Thomas Holcombe and Clarinda Pettibone. Henry Lyman Holcombe married Aura Pinney on 24 September 1828 at Granby, Hartford Co., CT. Henry Lyman Holcombe died on 28 December 1891 at Isabella Co., MI, at age 83. He was buried at Rail Road Cemetery, Granby, Hartford Co., CT.
Henry and Anna were enumerated in the 1850 Granby, Hartford Co., CT census. Brother Thomas G. Holcombe age 44. and Tryon Holcombe age 17 were also in the household. Although for several years past it had been understood that Mr. Holcomb could not live, still when the sad news that he was dead was announced Tuesday morning, it cast a gloom over our little city, and many were the words of regret and sorrow spoken at his loss. The illness that proved fatal, was contracted about five weeks ago, and although all that medical skill could do, combined with careful nursing and watchful care, he gradually grew weaker and weaker, until Monday evening at ten o’clock when he breathed his last and his spirit returned to God who gave it.  Mr. Holcomb was born August 22, 1808 in Granby, Hartford county, Connecticut, and was a son of Thomas and Clara Holcomb. He was reared to the calling of a farmer, and was engaged in that vocation until he was about 25 years old. At that age he embraced a seemingly _____? Project for improving his fortune, and operated for four years as a contractor on the canal then being built between New Haven and Northampton. He again engaged in farming for a short time and then went to Georgia and took contract on the Savannah Central railroad, and after two years at this work, he returned to the north; but in 1848 he again went south and became a contractor on the South Western, Savannah & Brunswick railroad, which contract occupied eight years of his life; when he again resumed farming.  In 1860 he came to St. Louis, then a small hamlet, and made extensive purchases of timber lands, owning about 2,900 acres in the aggregate, a portion of the tract including the land upon which a large portion of the present city of St. Louis now occupies. In 1861 he erected a saw mill, just north of the present site of the new flouring mill; and continued in its management until 1867, when he sold all his property in Michigan, and returned to Connecticut, and resumed operations on his old farm which he had still retained. Six years later he found himself once more in possession of his property here, the parties to whom he had sold, failing to pay for the same. In the mean time the village had been platted and part of the lots sold, and when he came here he continued to dispose of them. In 1869 Mr. Holcomb with his partner, Mr. EVANS, commenced boring for salt, and a depth of 200 feet struck the now famous mineral water..........................................[part of this area in the article is missing] which he managed until 1882, when he disposed of the property and practically retired from active business life, although he was connected with the bank of which he was vice-president when he died. should of been left for younger men, and during good and bad weather he has been at the mill giving it his personal attention. The undertaking, at least, shortened his days, for when the mill was just ready for the machinery, he yielded to sickness and November 28, he took to his bed, never to again leave it.  In every public enterprise he was always at the front, and St. Louis today, owes more to the deceased and his memory, than to any other man who has ever lived among us. The opera house, the row of large brick buildings adjoining it, the Frazier mill, the flouring mill, and his fine residence, all remain as monuments to his memory, and to remind us of what he has done for our little city.  Mr. Holcomb leaves a wife and one sister to mourn his loss.  Services were held at his late residence yesterday afternoon, conducted by Rev. Vernor and this morning his remains were taken on the 10:25 train to Granby, Connecticut, where they will be interred. [S25] Hannah McPherson, Holcombe Genealogy, Page 52.1/Item A-4-5-2-3-1-8-3. [S164] Carol Laun, Holcombe Collection, Page 5. Franklin Porteous Holcombe was born on 3 January 1813. He was the son of Thomas Holcombe and Clarinda Pettibone. [S25] Hannah McPherson, Holcombe Genealogy, Page 52.1/Item A-4-5-2-3-1-8-4. [S25] Hannah McPherson, Holcombe Genealogy, Page 52.1/Item A-4-5-2-3-1-8-5. [S164] Carol Laun, Holcombe Collection, Page 7-8. [S161] Carol A. Laun, Granby Center Cemetery, Page 82. [S164] Carol Laun, Holcombe Collection, Page 8. [S25] Hannah McPherson, Holcombe Genealogy, Page 52.2/Item A-4-5-2-3-1-8-6-4. Harriet Thompson Lusk was born on 14 May 1878. She was the daughter of Rev. William Lusk and Clara Pettibone Holcombe. [S137] Elisha Scott Loomis, Joseph Loomis, Page 384/Item 7322. [S161] Carol A. Laun, Granby Center Cemetery, Page 78. Franklin Holcomb Loomis was born on 25 June 1891. He was the son of Dr. Frank Newton Loomis and Mary Barber Holcombe. Franklin Holcomb Loomis married Lora M. Aschutz, daughter of Louis F. Aschutz, on 25 September 1921. Franklin Holcomb Loomis died on 15 May 1936 at Derby, CT, at age 44. He was buried at Pine Grove Cemetery, Ansonia, New Haven Co., CT.
Franklin Holcomb Loomis of Jackson Heights, N.Y., died Friday night at the home of his parents, Dr. Frank Newton Loomis and Mrs. Mary B. (Holcomb) Loomis, 100 Atwater Avenue, Derby. He was for 20 years manager of the sales division of the copper sheet and roofing division of the American Brass Company. He was graduated from the Sheffield Scientific School, Yale University, in 1913 and from the School of Business Administration, Harvard University, in 1915. During the World War Mr. Loomis was with the 131st Regiment, Field Artillery, 32d division, serving at Chateau-Thierry and in the Argonne. He was a direct descendant of Sir Isaac Newton. Besides his parents he leaves his wife, Lora M. (Anschultz) Loomis; two daughters, Nancy Loomis and Emma Jane Loomis, and a sister, Mrs. Nelson D. Booth of Orange. The funeral will be held at the home of his parents Monday at 2 p.m.
[S25] Hannah McPherson, Holcombe Genealogy, Page 52.2/Item A-4-5-2-3-1-8-6-3-2. [S182] Social Security Death Index (on-line), Ancestry.com, SSDI, Ancestry.com, SSAN 047-36-7245. Emily Almira Bradley was the daughter of Robert L. Bradley and Carrie Augusta (?) Emily Almira Bradley married Richard Erskine Holcombe Jr., son of Gen. Richard Erskine Holcombe and Harriet Jinks Thompson, on 27 September 1888 at Thomaston, Litchfield Co., CT.
Children of Emily Almira Bradley and Richard Erskine Holcombe Jr.
Helen Clara Holcombe was born on 10 October 1889 at Greenpoint, Brooklyn, NY. She was the daughter of Richard Erskine Holcombe Jr. and Emily Almira Bradley. Richard Erskine Holcombe III was born on 11 December 1890 at Richmond Hill, LI, NY. He was the son of Richard Erskine Holcombe Jr. and Emily Almira Bradley. [S25] Hannah McPherson, Holcombe Genealogy, Page 52.2/Item A-4-5-2-3-1-8-6-4-2. Robert Bradley Holcombe was born on 10 March 1893 at NY. He was the son of Richard Erskine Holcombe Jr. and Emily Almira Bradley. RFD 2, Arden, Newcastle co., Del., insurance broker, served in 1st. WW. Robert and Maude were enumerated in the 1930 New Castle Co., DE, federal census ED 83, page 10B. [S25] Hannah McPherson, Holcombe Genealogy, Page 52.2/Item A-4-5-2-3-1-8-6-4-3. Herbert lived in Washington, DC; served in the 1st World War and went to Australia in 1941 as Chief Warrant Officer in the US Armed Forces, where he remained; married. Herbert Kenneth Holcombe was born on 12 November 1896 at Flushing, Queens Co., NY. He was the son of Richard Erskine Holcombe Jr. and Emily Almira Bradley. [S25] Hannah McPherson, Holcombe Genealogy, Page 52.2/Item A-4-5-2-3-1-8-6-4-4.